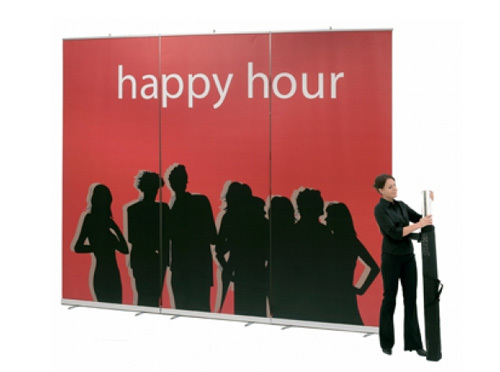 Expand MediaScreen XL is an extra wide, extra tall retractable display that is exceptionally suitable when your message needs to be seen from a distance.You can also easily create an even larger image by linking two or more displays, thanks to a magnetic connector at the top. Three displays, for example, provide an image that is 3.6 metres (11’-9 3/4”) wide and up to 3 metres (9’-10 1/8”) high. Expand MediaScreen XL is perfect as a backdrop for displaying logos, images,marketing messages or information at trade fairs, corporate general meetings, press conferences and in shopping centres. Thanks to the extra height, your message reaches above the competition’s.You assemble Expand MediaScreen XL in less than a minute. It is delivered in a nylon bag for convenient and easy carrying and storage.